It is used to relieve withdrawal symptoms and reduce the cravings for nicotine that you get when you try to stop smoking, or when you are cutting down the number of cigarettes you smoke while trying to stop smoking. If you smoke 20 or fewer cigarettes a day, the 2 mg nicotine gum will help relieve your cravings. 3. Chew again when the taste has faded. 4. Keep chewing like this for about half an hour. Step 1: Set a date to quit and stop smoking cigarettes. Step 2: Use the gum for up to 12 weeks (3 months) to relieve your cravings to smoke. Step 3: Start to reduce the number of gums you use. You should try to use fewer pieces of gum each day. When you are using only one or two pieces per day, you should stop completely. ➤ For those using the 4 mg Nicorette gum, the use of 2 mg gums may be helpful when withdrawing from treatment. ➤ If you need to use the product for longer than 9 months, ask your doctor, nurse or pharmacist for advice. 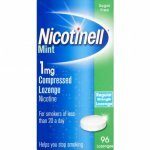 ➤ You might feel a sudden craving to smoke long after you have given up smoking and stopped using Nicorette Gum. Remember you can use nicotine replacement therapy again if this should happen. Step 2: Use the gum for 8 weeks (2 months) to relieve your cravings to smoke. Step 3: Reduce the number of gums you use over a period of 4 weeks. You should try to use fewer pieces of gum each day. When you are using only one or two pieces per day, you should stop completely. ➤ For those using the 4mg Nicorette gum, the use of 2 mg gums may be helpful when withdrawing from treatment. ➤ Do not use for longer than 12 weeks in total without asking for help and advice from your doctor, nurse or pharmacist. Step 1: Work out how many cigarettes you smoke per day. Set a date to start reducing the number of cigarettes you smoke. Step 2: Start reducing. Over the next few months, reduce the number of cigarettes you smoke by using Nicorette Gum when you feel the urge to smoke, until you feel ready to stop completely. ➤ If after 6 weeks you have not reduced the number of cigarettes you smoke, ask your doctor, nurse or pharmacist for advice. ➤ You should aim to stop smoking completely by six months from the beginning of treatment. Step 3: Stop smoking. Cut out all cigarettes and continue using the gum for up to 3 months to relieve your cravings to smoke. Step 4: Start reducing the use of the gum. You should try to use fewer pieces of gum each day. When you are using only one or two pieces per day, you should stop completely. - if you are pregnant or breast-feeding – you may be able to use nicotine replacement therapy (NRT) to help you give up smoking but you should try to give up without it. - if you are in hospital because of heart disease (including heart attack, disorders of heart rate or rhythm, or stroke). In other heart conditions not requiring you to be in hospital, using NRT is better than continuing to smoke. - if you have a stomach ulcer, duodenal ulcer, inflammation of the stomach or inflammation of the oesophagus (passage between the mouth and stomach). - if you have liver or kidney disease. - if you have an overactive thyroid gland or have a phaeochromocytoma (a tumour of the adrenal gland that can affect blood pressure) – your doctor will have told you this. - if you have diabetes – monitor your blood sugar levels more often when starting to use Nicorette Gum as you may find your insulin or medication requirements alter. - if you are taking other medicines such as theophylline, clozapine or ropinirole. Stopping smoking or cutting down may require the dose of these medicines to be adjusted.